Please protest, donate, and volunteer. Here’s how you can. Take the time to make sure you are well and then go protest for women. Go protest for people of color. Go protest for LGBT people. Protest in New York and L.A. and Chicago and New Orleans and D.C. Offer up your couch for a protestor to sleep on. Do not let down Barack Obama or Bernie Sanders or any of the leaders not a part of a major party. Do not let down yourself. Donate to Planned Parenthood and NARAL and volunteer to protect and expand women’s rights. Donate abortion funds to people who need them. Volunteer for LGBT rights and donate to a bilingual LGBT organization and help get homeless LGBT teens emergency housing. Volunteer for a hotline to stop trans suicide. Volunteer for the National Sexual Assault Hotline. Give a holiday gift to an incarcerated mom. Donate to the legal defense fund for water protectors on the Standing Rock Reservation and for Chelsea Manning already in prison. Raise and distribute bail and bond money for trans and gender non-conforming people and for the Brooklyn Community Bail Fund. Take your money out of the bank and put it in a federal credit union. Keep your private information to yourself. Volunteer at the U.S.-Mexico border and send money to people who do. Become a Child Advocate for an unaccompanied immigrant’s child. 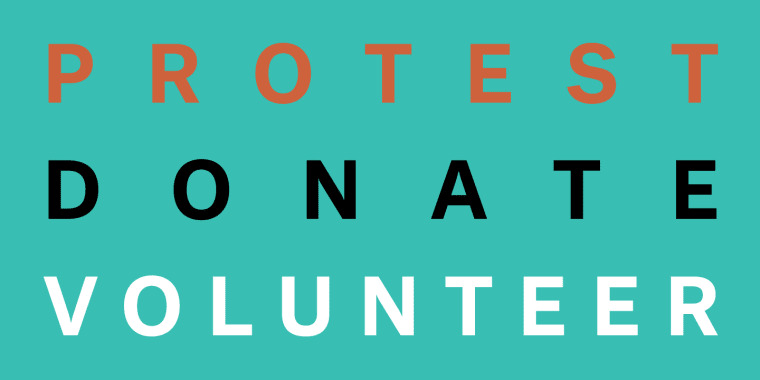 Volunteer for criminal justice reform and donate to the ACLU and Southern Poverty Law Center. Get involved with #BlackLivesMatter and By Us For Us. Donate to a Muslim rights group. Volunteer for Earth Justice and NextGen Climate and help the Earth Day Initiative. Volunteer for workers’ rights. Donate to the National Disability Rights Network and Disability Rights International. Join your local antifa and stomp out fascism.